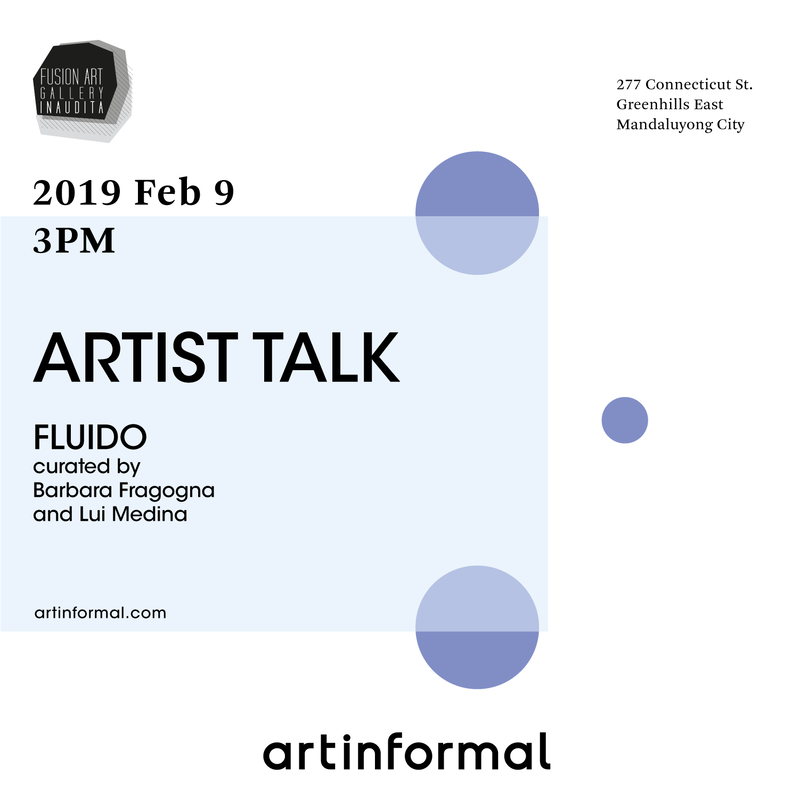 Artinformal, in collaboratin with Fusion Art Gallery / Inaudita in Turin, and preented in partnership with The Philippine-Italian Association, the Italian Chamber of Commerce in the Philippines, and Prestige Paper Production, is pleased to present FLUIDO, a collective exhibition curated by Lui Medina and Barbara Fragogna. 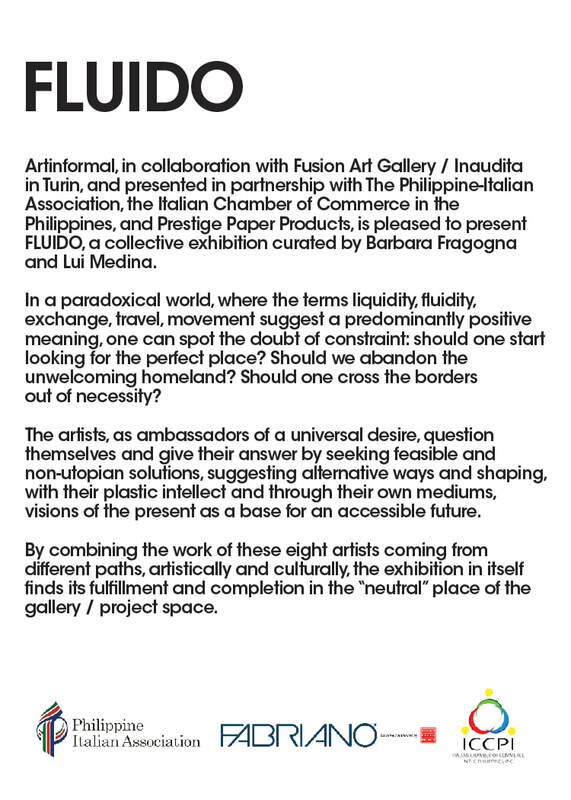 From this statement by Zygmunt Bauman stem the concept of FLUIDO, an exhibition that, by combining the work of 8 artists coming from different paths, artistically and culturally, finds its fulfillment and completes itself in the “neutral” place of the gallery / project space. In a paradoxical world, where the terms liquidity, fluidity, exchange, travel, movement suggest a predominantly positive meaning, we can spot the doubt of constraint: should we start looking for the perfect place? Should we abandon the unwelcoming homeland? Should we cross the borders out of necessity? Fluid as a flow of independent and original thought, a collective brain storming, like a river that with its slow and inexorable action shapes its own path, like a wind that carries the seeds of experience and spreads them, like a bundle that unrolls itself to create connections, neural networks, never virtual, always realistic. Fluid is the substance, the mixture that incorporates and glues the works of the eight artists whom, through their peculiar points of view, create a sort of map of an unaware treasure, a story, a tale. Moving from an artwork to another, from one individuality to another, from a photo to a video, from a drawing to an installation, the public will be able to invent, interpret and process their particular experience. We are going to produce the fluidity of a mysterious matter / dark energy in which every narration will be made possible. It is water that has shaped the face of the Earth for billions of years. Little streams that feed into rivers that eat away through land forming valleys, forever changing the landscape. Much like water is fluid, so have humans achieved the same. 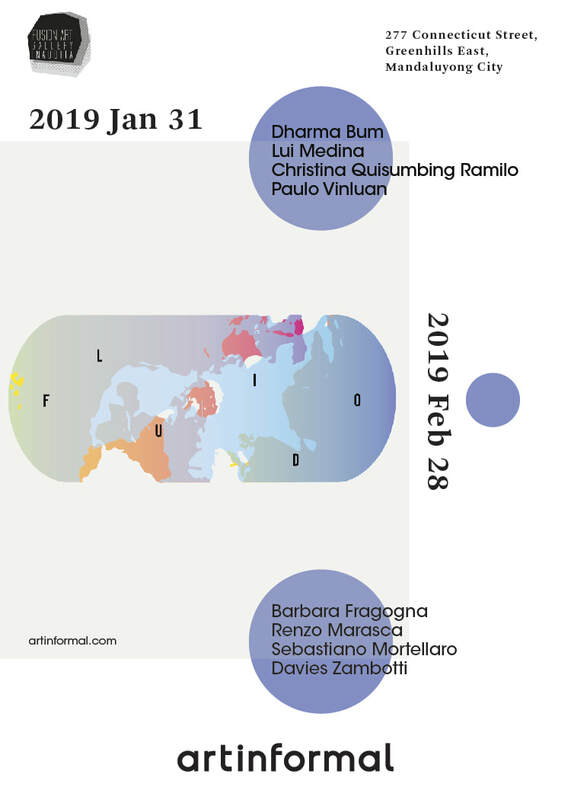 In the curated exhibtion FLUIDO by Barbara Fragogna and Lui Medina, 8 artists from Italy and the Philippines are brought together - having shared a common experience of having lived in different locales throughout their lives. The imprints of their time in these places provide the foundation of their works. Fil Rouge are two works from Renzo Marasca’s show Eutopia where thread was used to represent people - ever moving and changing - and how a collective action can bring about a transformation. A larger piece from that show was a large steel structure around which wool was spun around - as opposed to the silk thread used in Fil Rouge - and the unexpected was observed where in the repeated stringing of wool actually caused the steel structure to become deformed. Sicilian Sebastiano Mortellaro’s works The Wall and The Siege both resonate with the artist and with his life in Europe. A handmade print using a brick etched with an impression of Europe, The Wall brings to mind how Europe is a small continent, and yet there are so many barriers, so many walls, built by people who struggle to move forward through unified actions. Switzerland - neutral and not a member of the European Union is blacked out, while Sicily - visible as the island, echoes the artist’s sentiment of being Sicilian, and having to be Italian upon leaving the island. The Siege is a video work that juxtaposes the old Italian film of the same title, and footage of the places supposedly depicted in the movie. From celluloid grandeur to decrepit conditions, the work bears reference to those in power who only move to enact personal interests, laying siege to the people they are meant to protect. Bananas, water balloons, and other phallic imagery is scattered throughout Barbara Fragogna’s Everyday Life as a Man - rendered through drawings, photography, and a site-specific installation. The artist plays with ambiguity, as all the seemingly male subjects in the photos are the artist herself. It is not just about gender, it is also about power - symbols of patriarchy evoke how the people are being f**ked up by those in government. The drawings - executed with print-like precision - bear imprints of guns and skeletons, the latter for their androgynous characteristic: the patriarchal systems is not only patriarchs. Of particular interest to Barbara is the toy gun, but rendered in such realism that it puts to question the appropriateness of its function as a children’s plaything. Director Davies Zambotti’s photography and video work Scomodi Dialoghi (Uncomfortable Dialogues) starts of with the scripts that she writes, and that sets the scene. The photographs - taken from vehicles moving between Milan and Turin - obscure known landscapes into unidentifiable scenes. Is it a sunset? an alien craft? They are wherever your mind’s eye takes you. In the video, there are mostly two sections, the top showing a road traveled at night, bumping into animals and various dead ends, while the bottom has varied imagery. Davies marries the external with the personal, as the road envisions people in motion, trying to find the light, not knowing that they themselves could be the light that they are chasing; while her own queries are posed in the bottom half - like celebrating pride on the one day, but disappearing into nothing on other days as the candles melt down completely. As she moves throughout Turin, she traverses paths made by other people and herself. Drawing from the transformed everyday, Christina Quisumbing Ramilo utilizes household items, bearers of the use and disuse of the people who handled them, in her work Domain. Strewn with sawdust, from trees to wood, trimmed down to fit whatever construction humans need, Domain seems to be both a formidable structure - a castle or fortress, or an ant or termite hill. Maybe it’s a metaphor of how humans eat away at their own accomplishments? Perhaps Domain is like the cycle of life - fluid across territories - that transforms us. Dharma Bum ponders time. The preoccupation with time. Time out of mind, time on my mind. Not enough time. Lost time, time is money. The need for time. Time is a preoccupation. It is methagold. It can be bought... can it? It is the most basic currency of Existence and once it has come it is gone....as Bukowski in his poem so eloquently says… days go by like wild horses across the hills. And in the Bible there will be time. TS Elliot… time for you, time for me. Time melts, time is limpid, time is impotent, re: Dali’s landscapes, and time Time time like a river flows away. Visions of a snow-covered mountain top flanked by trees awaiting the next spring, Lui Medina uses Untitled (Valgrana) II as a springboard, echoing the use of landscapes in Art to envision ideal worlds. This “ideal” is what the artist is focusing on in her current works, grounded on archipelic thought - neither one person’s nor a collective’s identity is permanent. Moving between places, gaining and losing cultural knowledge - creolization is brought about by migration, and the artist has just begun her exploration of these territories. A geometer’s creation begins with a point, and between two points, a line is formed. When lines intersect, or their end meet among multiple lines, shapes are formed. In Paulo Vinluan’s Valise, these shapes evoke landscapes, defined, detailed, discovered. The video traverses shapes being born out of the chaos, and out of each other. These are places you see in your mind flowing back and forth from the familiar and unfamiliar, accompanied by musical patterns out of the artist’s own compositions. Even on cold, distant Mars, remains of possible rivers and water formations are seen as key to understanding the past, and what lies in the future. Boundaries, territories, geopolitics and identity are all explored in FLUIDO, carving through a “defined” space and forging a path towards a true, realistic understanding of the human capability. landscapes as framework and not just as subject matter. From geologic to geographical forms, her works explore the plasticity of topographies and how expanses can become isolated parcels, islands into sprawls, landscapes without landmarks, mainly with the use of graphite. This interest in shapes and the organic has in turn also shaped the canvases and materials that she uses for her drawings and paintings. Her recent exhibitions include ‘Where does landscape begin?‘ (2016) and an eponymous exhibition in 2014 both at Artinformal, and ‘Metamorphic Histories‘ (2013) at Vargas Museum. She has been part of exhibitions at the Langgeng Art Foundation in Jogjakarta (2017), Mind Set Art Center in Taipei (2016), and Equator Art Projects in Singapore (2015). In 2018, she was artist-in-residence at Fusion Art Gallery / Inaudita in Turin, Italy. Sebastiano Mortellaro lives between Torino and Siracusa. He obtained his schoolleaving certificate at the Art Institute of Siracusa, and after attending for two years for a course in Painting led by Alberto Garutti at the Brera Art Academy in Milan, he obtained the degree in painting at the Fine Arts Academy ‘Mario Minniti’ in Siracusa with the artist Alfredo Romano. Since November 2008 he has been included in S.A.C.S archives of Palazzo Belmonte Riso, a museum of contemporary art for Sicily. namely noted for winning the Premio ORA Award (2013), the Celeste Prize (2008) and the Morlotti Prize (2004). His most recent solo exhibitions, Allegria (2018) and Meorie Della Marca –On 1968– (2018) focus on his discussions of the personal, in the form of memories and the imagination. The project is the result of the encounter with Lui Medina, an international Filipino artist which has been resident artist at Fusion AIR - Inaudita’s in January and February 2018. The establishment of a strong relationship of esteem and collaboration with such a artist has brought to an exhibition and a publication, and with her second visit and personal exhibition at the QuasiQuadro space she has widened the network of the subjects involved.